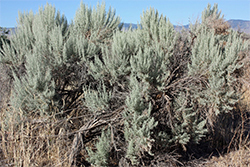 Idaho's approach is through Genes to Environment: Modeling, Mechanisms, and Mapping (GEM3). This statewide project combines research strengths in bioinformatics, complex modeling, ecology, fisheries science, genomics, geospatial science, remote sensing, and social-ecological systems (SES) science to contribute to one of the most compelling and contemporary national challenges of our time – understanding the "Rules of Life: predicting phenotypes from what we know about the genome and environment". At the same time, an additional goal is to strengthen and diversify Idaho's STEM workforce. GEM3 includes a statewide participatory research program committed to the concept of Idaho EPSCoR's "ONEIdaho" vision of an integrated, productive and creative research culture and community of Idaho researchers that transcends institutional boundaries. GEM3 researchers will work across institutions on pilot studies and case studies, fostering integration of science and stakeholders, integration of science disciplines, and integration of research and education. A fully integrated research, education, diversity, and workforce development program will be implemented to increase the number, diversity and preparation of skilled scientists and engineers in GEM3 fields (bioinformatics, computational biology, conservation genetics, ecosystem management). 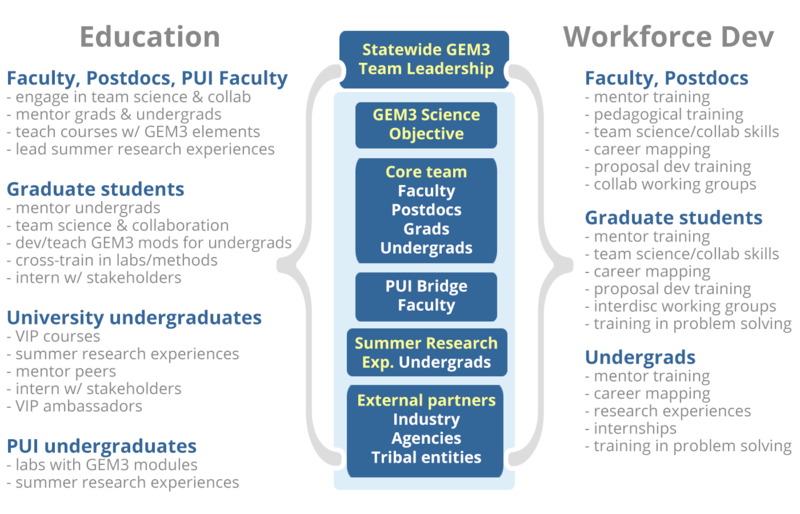 GEM3 adopts a Vertically Integrated Projects (VIP) strategy to establish an on-ramp for students and provide a range of training, mentoring and professional development support to both students and faculty; it will be implemented statewide. The goal is to provide the scaffolding to support transdisciplinary science and grow the next generation of conservation science leaders and workers. GEM3 will leverage state and federal resources to promote sustainable outcomes. 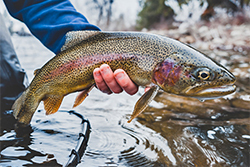 Overall, 61% of Idaho land is owned and managed by federal agencies. Engagement of agency partners at all levels (biologists, land managers, policy makers, and administrators) will facilitate integration of science into management and policy and provide opportunities for knowledge sharing and development of professional networks between students and potential future employers. value add to national strategic priorities. A core group of over 30 GEM3 researchers and educators, many with existing cross-institutional and cross-discipline collaborations worked together to develop this inspiring research and education plan. GEM3's vision is to become a national leader in identifying and understanding the genetic and environmental mechanisms that contribute to adaptive and resilient species and landscapes, leading to evidenced-based resource management policies and practices. Idaho's landscapes span a range of environmental gradients (e.g., temperature, aridity) and encompass divergent social-ecological contexts, from designated wilderness to expanding urban areas. These "natural laboratories" enable the systematic discovery of mechanisms of genomic expression for species in changing environments. GEM3's research hypothesis is that genetic diversity, or more accurately adaptive genetic variation, of populations will vary across key landscape axes in predictable ways and influence the adaptive capacity of populations. 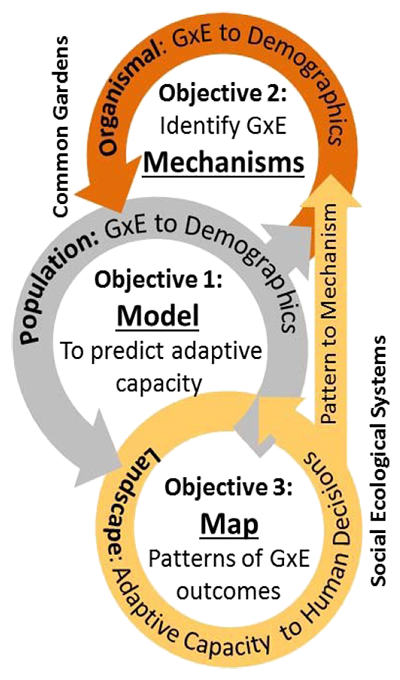 map, monitor, and manage genotype by environment outcomes in populations across complex Social Ecological Systems (SES).